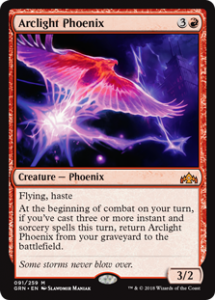 Welcome to the Metagame Report: the hopefully monthly article series where I, Brandon Scott, on-and-off Magic: The Gathering player of a decade, give my unsolicited opinions on 8 of the most powerful decks in the Standard metagame. Mono-Blue Tempo is the weirdest beast I’ve seen in a while. It’s breaking some of the most basic rules of the color pie. In any other situation, I’d be skeptical. It runs creature enchantments with downsides. The oddball deck is a mix of little evasive creatures and counterspells and not enough lands—red decks run more typically. 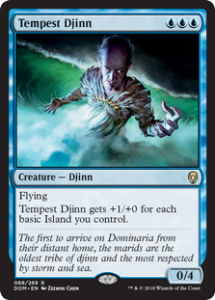 And, yet, if you don’t prepare for this monster, and don’t have ways to deal with a Tempest Djinn, you die. You just die. If you haven’t already, build this on Arena! 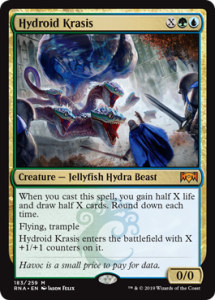 Hydroid Krasis is absurdly expensive in paper but is nothing but 4 Mythic Wildcards on Magic The Gathering: Arena. 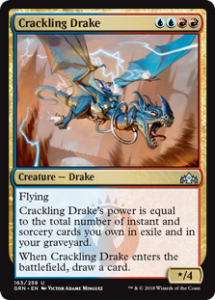 If you do somehow have access to this monster of a deck in paper or are sitting across from it, know there’s a reason it’s maybe the best deck in standard. Against it, your creatures die and theirs do not. Fighting this deck is fighting against math: they will attrition you down if you don’t just lose to getting smacked by Jadelight or your own creature stolen by Hostage Taker. The deck basically must be killed in one or two shots, or it needs to stumble hard, otherwise it can recover from seriously nasty beatings and turn the game around violently. Whoever made the name for this deck must have chuckled to himself. It’s a literal conflict in a name. 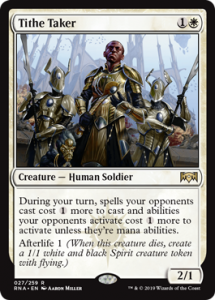 But, regardless of what they call it, it’s a permutation of white weenie that happens to be able to run counterspells and some other tricks. Out of the powerful decks in the meta, this is the one I find the most boring. 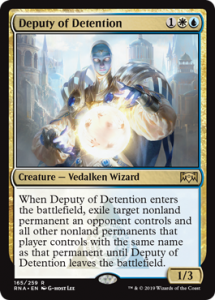 It seems like Azorious Aggro decklists have been straying from Deputy of Detention too—and I’m not a fan of that choice. If you don’t have a way to stop them from going wide—or Tithe Taker slows you down—you will know the pain of a thousand small cuts. I was there when Mindsculpter saw play. I have had so many Sphinx’s Revelations cast on me right when I was about to kill a W/U control deck that I get twitchy when I see the card played in Commander. And, with all that said, at least those decks had the courtesy to kill you eventually. Esper Control is perhaps my least favorite deck to play against or even see at a table nearby me. 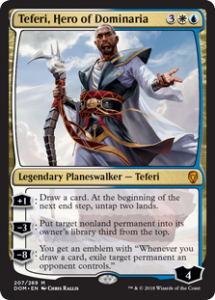 Teferi is a card that forces you to concede because you don’t get to play cards anymore. Sometimes that’s the only real win-con in the entire deck. Out of all the annoyances the deck runs, I find the consistent Thought Erasures to be the most galling. I was also there for Thoughseize and this feels too much like that for comfort. 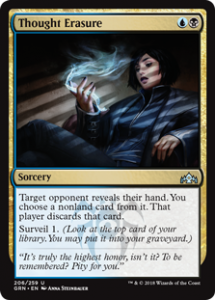 In short, Esper Control very well may be a combination of pseudo-reprints of some of the most devastating cards in Magic: The Gathering‘s recent history. That’s not to say don’t play it. If piloted well—and it does take a lot of skill to use—it’s nearly untouchable. If you’re playing RDW against Esper especially, you lose. Sorry. At least they don’t take infinite turns anymore. There comes a time playing against this deck where you’re dead, but you must wait for them to get around to killing you. Turns out generating more mana in one sitting than anything outside of Commander or an infinite combo is not only strong but lethal. 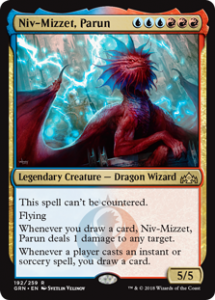 Niz-Mizzet, Parun is not secret tech to this deck, but it’s shockingly destructive if it’s ever allowed to stick. The number of triggers that can happen in a single turn if you even try to play cards is staggering and will turn your life total to mush. The deck is essentially a surgical ramp deck but feels like playing against a combo deck that kills you while it draws its entire deck. 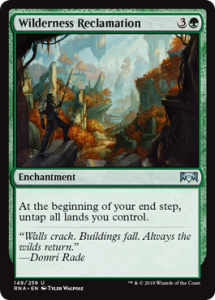 If you end up losing footing and letting them go off, you may as well just sit back and think about sideboard decisions while they make their Explosion hit for more than your life total in one mighty Wilderness Reclamation trigger storm. It took a long time for Growth-Chamber Guardian to see the play it deserved. But here we are. Aggro is my usual go-to strategy in Standard and Draft, and this is essentially one permutation of the way to build it. You either play value creatures that hit hard should they stick, or go lower and swarm with lower impact—but compounding damage. 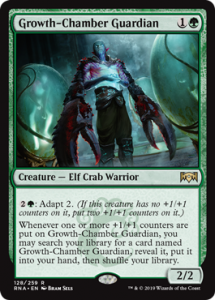 Gruul goes top heavy and uses an intuitive selection of the best creatures under 6 mana. 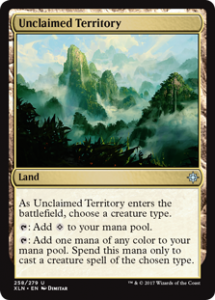 The addition of Unclaimed Territory with warrior as the chosen type turns what might have been a seriously rough mana base into something deadly. Like all aggro decks, board wipes and big blockers can sweep them into a bad spot, but, if you want to play an aggro deck that’s not going to be blown out by a little life gain, this is the choice to go for between Gruul and RDW. 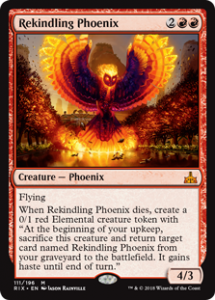 It’s a little more midrange, and if Rekindling Phoenix fails to die and gets at least one buddy—perhaps an infuriating Gruul Spellbreaker—life totals drop fast. 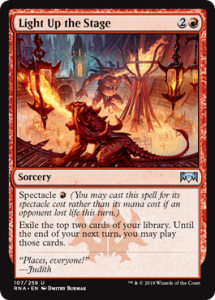 It’s been a long time since I’ve seen a Red deck that did stuff this fast and with so many non-creature spells. It feels like Modern Burn. 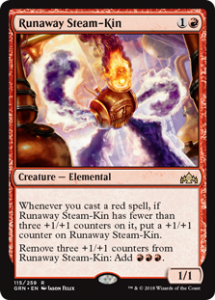 Light Up The Stage and Experimental Frenzy prevents RDW from running out of cards, and if you’ve never been on the receiving end of a chain of Runaway Steam-Kin mana bursts, you don’t know how many spells someone can play with like three mountains. 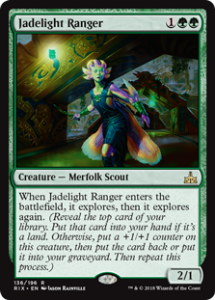 Certain versions are currently running Gruul cards in the sideboard, but, regardless of the exact list, the deck functions the same. 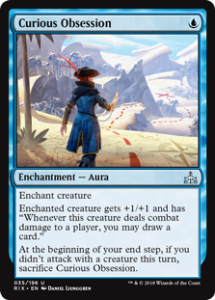 There’s something intoxicating about preventing your opponent from doing their entire plan simply because they died before they even got to play their first multicolored card or fancy planeswalker. 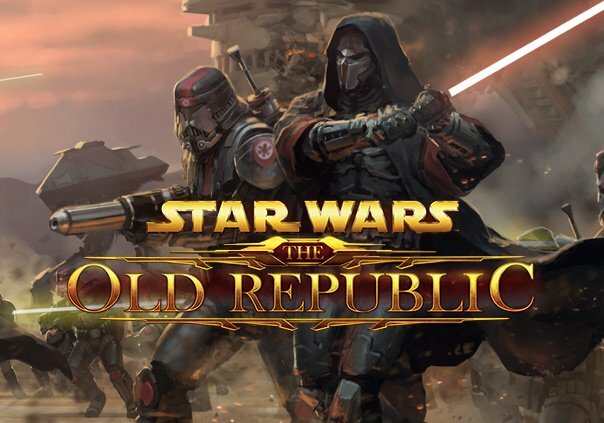 RDW has always been a deck for those who want to play standard on the cheap and acts as a gatekeeper to prevent slow decks from rising too much in the meta. Always plan for the red deck. 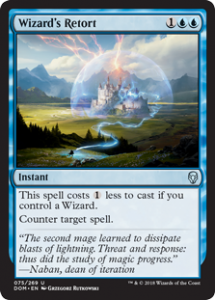 Oh look, Storm is in Standard now. Arclight was once $3 a copy. 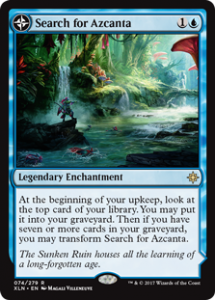 Now it’s a staple of Modern and Standard and is easy to cheat out if you optimize your deck to do so. I’m super excited for this deck, even if it’s a little linear with its strategy. 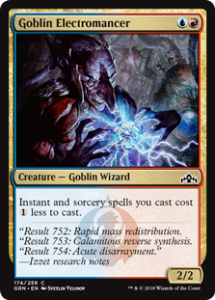 Simply put, you need to kill the Goblin Electromancer the turn it comes down, or you will witness a bevy of card draw spells chained together that will quickly revive up to four phoenixes. Then shortly afterward you’ll be staring at a Crackling Phoenix that will kill you in maybe two hits—if you’re lucky. 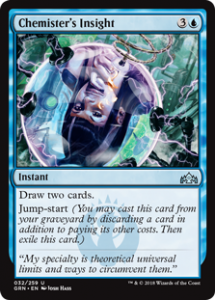 The deck functions for the simple reason that there’s no good way to exile graveyards in Standard. 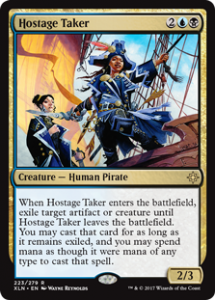 If it gets anymore warping to the format, we might see hate cards printed. 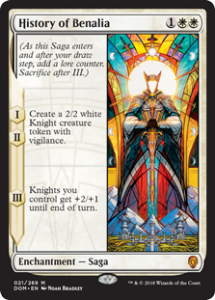 Any new cantrips printed might just tip this deck over the edge. Or pump up it’s more Drake-focused variant. And, there you go. A snapshot of Magic: The Gathering Standard decks. What will take the next major tournament? Is there some new scary deck only waiting to be unleashed? I don’t know. 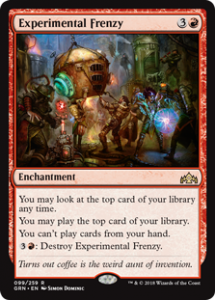 But, if you’ve got the mana base built, there’s little you can’t try in this bold new Standard.